Why Do We Need Horizontal and Vertical Cable Managers? With the increasing numbers of cable counts and devices, cable management in data centers is becoming more and more important. Can you imagine that after installing all network devices in the rack, you’re ready to have a break with the joy of success, and you should find bunches of cables everywhere? To make it worse, if one of the cables is broken, you have to exam every cable in a mess to find the culprit. Wouldn’t it drive you crazy? Fortunately, there are many excellent products available on the market that can help run cables under orderly and efficient management. This article will introduce horizontal and vertical cable managers. What Is Horizontal Cable Manager? Horizontal cable manager can manage almost all kinds of cables such as fibers, coaxes, patch cables, copper wiring, jumpers and so on to ensure rack cables are well organized and protected. 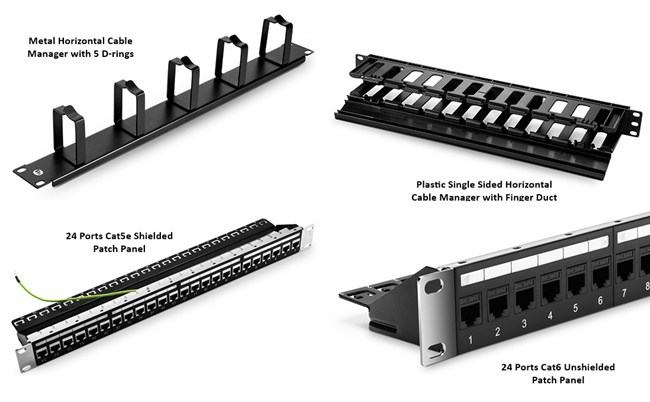 It is commonly used to manage cables on front racks and used with patch panels or rack mount enclosures to provide cables a safe and organized pathway from switch ports into the vertical cable manager. Horizontal cable manager is designed with various forms such as D-rings, finger duct, brush strip, lacing bar and end ring, which can be assembled randomly to simplify cabling efficiently. Vertical cable manager provides a vertical pathway for a large number of cables from switches to patch panels in the rack system. It utilizes extra space to secure, bundle and route the cables at both sides of the racks, cabinets, and enclosures. The most popular vertical cable managers are single D-ring vertical cable manager, 5U plastic vertical cable manager with bend radius finger, and 45U 4.9″ wide plastic vertical cable manager. All of those vertical cable managers help provide proper bend radius support for cables and supply users with a neat and organized cabling system. Horizontal and vertical cable managers have its own features, here we list their advantages separately for your reference. Horizontal cable manager can run cables orderly and efficiently, prevent cables from tangling together. Therefore, the technician can easily identify and access the error and fix it right away, which minimizes downtime. And we can add new ports and cables and track their locations without worrying about causing problems. As rack cables properly installed, the risk of excessive bending or subjecting cables to heat sources or sharp edges minimizes. Therefore it extends the longevity of cables. Since cables neatly collected, there is less risk of airflow obstruction. As fans and air conditioning units do not have to work overtime to cool equipment, it ensures data center runs efficiently. Vertical cable manager separates power and data cables within the racks, which greatly reduce the chance for crosstalk and interference and help enhance system performance. Vertical cable manager helps maintain cable bend radius within the ranges specified for the type of cable being used. Therefore it reduces the chance of being damaged. Vertical cable manager can eliminate the airflow blockage and enhance the cooling efficiency within the rack. Vertical cable manager can be used with angled patch panel directly, which reduces the usage of horizontal cable management panels and cost. Horizontal cable manager with D-ring is an open-access management tool, which means the D-rings offer an “open” and efficient way to manage cables on the rack. Besides, the design of D-rings provides great flexibility for users to add, move or change components and cable in the system. You can combine horizontal cable manager with D-ring with various cable management products for different applications. Horizontal cable manager with finger duct provides a series of fingers and pass-through holes for routing rack cables and reducing cable strains. Moreover, it features a detachable top cover that provides flexibility for users to add or remove cables. Horizontal cable manager with finger duct is typically used with server racks and cabinets, structured wiring closets to keep cables clean and orderly. Horizontal cable manager with brush strip is usually made of steel and nylon bristles. It allows cables to pass from the front to the rear of the rack, facilitating proper airflow through the rack and preventing dust and dirt from entering and exiting the rack. Vertical Cable Manager with D-ring is designed with a standard EIA hole spacing which allows products to be mounted to any standard rack. It also features with a flexible arm to provide an open access to allow installation of complete cable bundles. Vertical cable manager with D-ring can prevent sharp edges and occupies high capacity of cables, which makes it popular among customers. Vertical cable manager with bend radius finger is lightweight and can be mounted in specific areas of the rack to reach any height(U), making it an alternative of higher vertical cable management. It provides extra-deep cable management capacity for applications required large Cat5e/Cat6/Cat6a cable bundles or thick cables. 45U single sided vertical cable manager equips with a user-friendly cover to protest cables from dust and damage. It’s designed with smooth oval holes to provide easy front-to-back cable routing and with flexible fingers to ensure optimum cable radius. It’s usually installed on open racks to organize and protect cables on the front of the rack without taking up the space of racks. Cable manager is essential for data centers. An improper cable management can easily lead to a series of problems like data transmission errors and performance issues as well as system downtime. Horizontal and vertical cable managers are two important tools used to solve cable managing problems. If you have problems with this, do not hesitate to visit FS.COM. Horizontal Cable Management VS Vertical Cable Management: Which to Choose? This entry was posted in Cable Management and tagged horizontal cable managers, vertical cable managers on November 26, 2018 by Admin.